Every emotion of the heart is reflected in the Psalms with words that express our deepest and strongest feelings. They provide comfort and joy, leading us to the place where worship flows. This poetry on fire is divided into five books, mirroring the five books of Moses that form the first books of the Old Testament. Together they convey the depth of our longing and fears, joys and celebration, becoming a mirror to the heart of God's people in our quest to experience God's presence. The "Numbers Psalms" is Book Four in this anthology of Hebrew poetry. It is composed of a series of praises and prayers for our pilgrimage on earth, giving voice to the highs and lows of our life-journey and drawing our attention to the sovereign Lord who reigns over it all. Throughout this collection, psalmists remind us of our Eternal God who is our safe and secure shelter, enthroned as God Most High. In response, we're called to praise his rule and celebrate his compassion. We're also invited to pray for help, knowing that he will listen and act because of his past faithfulness. We've designed this study to help you explore these praises and prayers placed inside poems that spill out of a fiery, passionate heart. 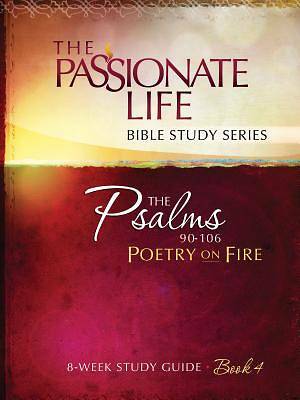 May this study of poetry on fire free you to become a passionate, sincere worshipper, and experience the heart of God anew in faith and worship.